TORONTO, July 16, 2014 — Toronto Real Estate Board President Paul Etherington announced that Toronto MLS home sales through the first 14 days of July 2014 were up by 11.6 per cent year-over-year to 3,891. New listings were also up compared to the same period in 2013, but by a lesser annual rate of 9.7 per cent. “There are two key takeaways from the July mid-month results. First, given the continuation of strong sales growth, it is clear that buyers are still attracted to affordable home ownership options in the GTA. Second, if new listings growth begins to outpace sales growth, we could start to see an improvement in the overall supply of homes for sale. This would be a relief for some buyers who have been hard pressed to find a home that meets their needs in this tight market,” said Mr. Etherington. 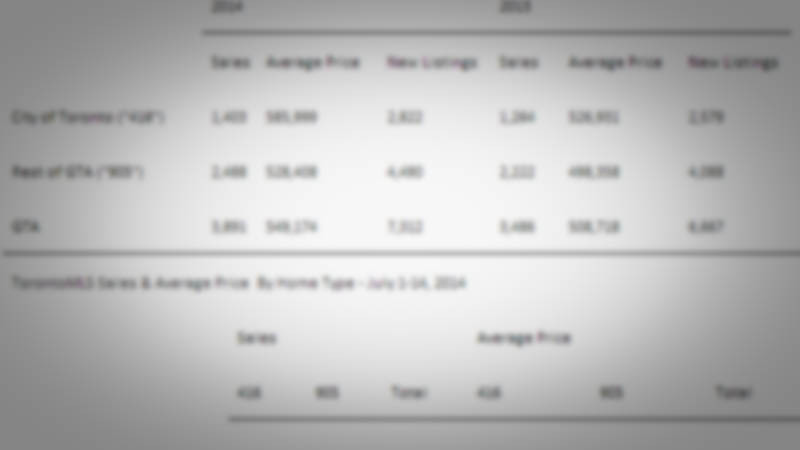 The average selling price for sales reported during the first two weeks of July 2014 was $549,174. This result was up by eight per cent compared to the same period in 2013. The strongest rates of price growth were reported for semi-detached houses and townhouses in the City of Toronto. “Annual average price growth remains in the high single-digits or low double-digits for many home types across the GTA. It is possible that we could see more choice for buyers in the second half of 2014 in the form of increased new listings. A sustained increase in choice for buyers could serve to gradually ease the pace of price growth in some market segments,” said Jason Mercer, the Toronto Real Estate Board’s Senior Manager of Market Analysis.